Although the stations of Kochi Metro, launching on June 16, showcases the beautiful Western Ghats, the view outside the metro reflects an unclean city. 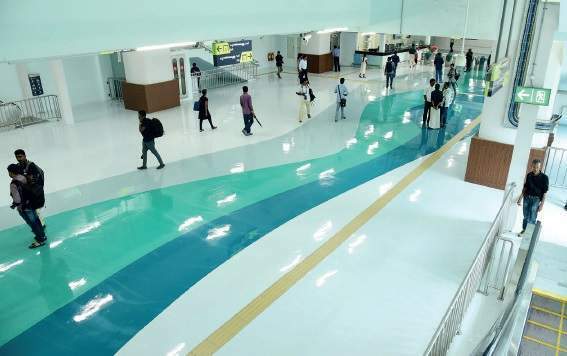 KOCHI: When the Cochin International Airport (CIAL) opened in 1999, everyone talked about how it looked different and better than the bigger, busier airports in Delhi and Mumbai. The breathtaking beauty of the rain-soaked fields, verdant greenery and the rivers surrounding the airport boosted its appeal among travellers. 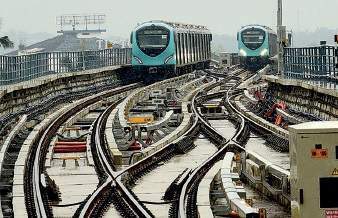 Kochi will, in nine days, to be precise, be launching another showpiece infrastructure - the Kochi Metro Rail. The level of excitement in the city is on par with what was witnessed during the days running upto the inauguration of CIAL. During the maiden trip, arranged by KMRL for the media, on Wednesday, from Palarivattom to Aluva and back with stopovers at important stations such as Kalamassery and Muttom -- the verdict was clear. The Kochi Metro stands out from others as the best in the country, in terms of its aesthetic sense and technology. Everything, right from the traditional Kerala music to the interiors and exteriors of the stations reflect the true Malayalee touch. The Western Ghats is the common theme for all stations. Moreover, each individual station reflects a variant of the main theme. The Aluva station, which is the starting point of the journey, showcases Kerala’s natural beauty with special focus on the Western Ghats. The walls will have Periyar and the other main rivers meandering through. The floor has been designed to give a passenger the feel of wading through a river. Medieval Kerala and marine heritage adorn the walls of Cusat station. Spice route, Silk route, Eurasian Steppe route, Vasco da Gama’s voyage, early sea routes to India and other trade and connecting routes have been detailed with the help of a map. Edappally and Changampuzha Park stations will showcase the spices of the state and its cultural and artistic heritage, respectively. When one looks out of the Metro train the view is not awe-inspiring. Windows of Kochi Metro frame the city’s underbelly. Garbage lying in heaps, discarded vehicles, half-finished buildings and potholed roads does not present an impressive picture. If the view from a flight is awesome, the view from the Metro Rail is an eyesore. There’s no place to hide as one travels from one metro station to the other. Kochi’s famed ‘Queen of the Arabian Sea’ tag gets a severe beating. The local bodies along the Metro Rail corridor will have to now actively work towards city beautification and infrastructure development.